Due to the affection of the southwestern monsoon, the region in the middle and south of the east sea (including Truong Sa archipelago) experiences strong wind, rough sea. Strong sea waves are forecast to reach up to 2 to 4m high, said the National Center for Hydro Meteorological and Forecasting. The coastal provinces of Binh Thuan to Ca Mau have strong south west winds of level 5 to 6. 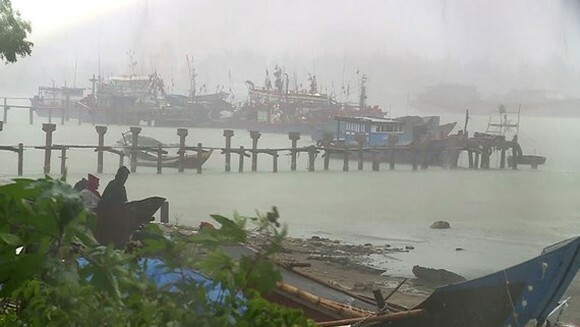 The areas from Binh Thuan to Ca Mau; Ca Mau to Kien Giang and the Gulf of Thailand continue experiencing torrential rains, strong thunderstorms and possible cyclones. The center warned at 11am to 13pm today, the central highlands provinces of Kon Tum and Gia Lai faced heavy rains with total rainfall at 10 to 30mm. This late afternoon, evening, high risk of landslides in the mountainous areas and flash floods can occur at the lowland areas of Gia Lai, Kon Tum and some areas of Chu Prong, Chu Se districts (Gia Lai).